The situation in Syria may result in negative consequences if the opposition does not change its approaches to the settlement, according to Russia’s authorities. "We look at this situation pessimistically, if the current trend is maintained. If the leading opposition groups opt for revolution this will only mean that they are not going to stop," Russian Foreign Minster Sergei Lavrov told the press on Monday. "It is difficult for me to suppose that in such a situation the government forces would want to disarm unilaterally or to pull out from populated areas." This statement seems to have added up to the ongoing tensions in the Middle East region. The last week visit of the SNC leaders to Moscow indicates that this key opposition force recognizes Moscow’s leading role in resolving the crisis. On the other hand, the very fact of the negotiations in Moscow demonstrates that Russia considers the SNC to be one of the chief negotiating parties. This is already considerable progress, even though the meeting in Moscow did not result in any diplomatic breakthrough, nor was it expected to do so. Lavrov tried to come up with a compromise with the Syrian opposition when he received a delegation from the Syrian National Council (SNC) in Moscow. This was the first official meeting between the high-ranking Russian official and the leaders of the core political structure of the Syrian opposition. Judging from Russian media reports, the negotiators not only shared their visions of the situation, but also touched on Russia’s new proposals for handling the crisis in Syria. As follows from the statements made after the talks, Russia and the SNC confirmed that their fundamental positions were diametrically opposed. The SNC believes Chapter VII of the UN Charter, which envisions possible use of force to address threats to peace and acts of aggression, should be invoked. “The best resolution would be interference in the conflict sanctioned by the Security Council, in which Russia would take part,” SNC Chairman Abdulbaset Sieda told reporters following his meeting with Lavrov. Russia does not support either demand, which does not mean that the contacts between Moscow and the SNC, which is regarded in the West as the mouthpiece of the Syrian opposition, are over. In fact, the opposite seems to be the case. 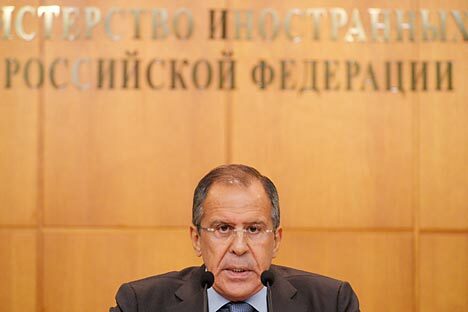 Lavrov thinks that it is unrealistic to persuade Syrian President Bashar al-Assad to resign. "That's simply unrealistic, and I have said that before. It is not a question of our preferences, likes or dislikes," he said at a Monday press conference in Moscow. "He won't leave not because we are defending him but simply because a very significant part of the population in Syria stands behind him," the minister added. We can only guess what sort of proposals Lavrov made. They might pertain to mediating between Damascus and the opposition. It is important to note, however, that the SNC represents the purely political opposition – the organization is headquartered in Turkey and incorporates a variety of opponents of the president, who come in various political hues. The war in Syria is currently being fought by other forces. In this context, Sieda’s statement made before his visit to Moscow appears quite interesting. “It is well known that Russia supplies weapons to Syria. That’s what we will be talking about in Moscow,” he said. The Washington Post has reported delays in arms supplies to the rebels during the last two weeks. This pause, which might be only temporary, could reflect the growing concerns over militarization of the 16-month conflict. The newspaper attributed the delays in arms delivery and financing to a plan by Qatar and Saudi Arabia to give diplomats more of a change to settle the conflict. Sources quote by the paper in Syria believe that Russia might also cut arms supplies. The delay in delivery of 36 Yak-130 trainers and battle fighters to Syria until the conflict has been resolved should probably be considered in the same context. Vyacheslav Dzirkaln, deputy chief of the Russian military and technical cooperation agency, announced the postponement of the contract the other day. Apparently, the armed opposition cannot defeat Assad’s regime without foreign interference, and this will be essentially an armed intervention. The conflict that has been ongoing for a year and a half has shown that Assad has military potential and enjoys support among sectors of the population. The armed opposition is essentially engaged in a guerilla war, from which neither conflicting party will benefit. Under the circumstances, the political weight of such opposition groups as the SNC will fall. They have nothing to oppose to this except restraints on arms supplies – that is the only way to mitigate the conflict and take the resolution process entirely on to the political track, where the opposition, especially the SNC, plays a major part.